With Thalgo&acute;s Biodepyl Method, your hair removal sessions may be further apart! This alcohol-free product has been formulated for all your sensitive areas - underarms, lip, brows, chin, and bikini area. This Gel retards hair growth and is to be used continuously between your hair removal sessions. Contains essential oils of Lemon, Lavender, Verbena, Camomile and Citron, with Capislow and Efficiensea (Algae Extract). With Thalgo&acute;s Biodepyl Method, your hair removal sessions may be further apart! This Concentrate is to be used immediately after your hair removal session and during the following 3 days. You&acute;ll just spray it on and allow it to absorb completely. The Concentrate contains Capislow and essential oils from Lemon, Lavender, Verbena and Camomile; the combination of these moderate and retard hair re-growth. You may also notice as your hair grows back that it is thinner and shorter. Also contains Efficiensea, an Algae extract, to soothe any irritation caused by hair removal. With Thalgo&acute;s Biodepyl Method, your hair removal sessions may be further apart! 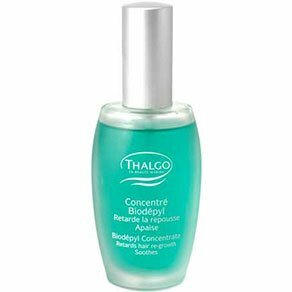 This Biodepyl Fluid works in combination with Thalgo&acute;s Biodepyl Concentrate as a follow-up treatment. This Fluid continues to retard hair growth while it hydrates and softens your skin, and is to be used 4 days following your hair removal session until your next salon/spa visit. Apply morning and night to concerned areas, and we recommend exfoliating your skin once per week for optimum results.